“The only way to get him in a game is to have him shoot 3s,” Stuart Wolff says from beneath the north basket at the Borchard Community Center in Thousand Oaks, California. It’s 4:43 p.m. on a Wednesday in May, and Stuart’s 14-year-old son Max stands on the left wing, behind the 3-point line, resting between rounds of shooting practice. He just took 60 straight shots from behind the 3-point line — 10 a piece from the right and left baselines and right and left wings, and two sets of 10 from the top of the key — hitting 12 in a row during one stretch. “Max, you hit 41 out of 60. What is that?” Stuart asks while tapping Max’s results into Evernote on his iPhone. Now it’s time for another 40 shots — 20 from the top of the key, and another 10 from each wing — only this time from “deep 3” (the Wolffs’ term for a step behind the arc). “This is to extend his range,” Stuart explains from beneath the basket, rebounding so Max doesn’t have to waste time chasing after each shot. At times when Max gets on a hot streak, he and his dad enter into a seamless, nearly trance-like rhythm; Stuart grabs the ball immediately after it falls through the bottom of the net with an unmistakable thwooooop, rifling a pass back at Max in one motion, who catches it just as he’s coming out of his follow through and shoots it back toward Stuart. The ball never touches the floor. Max proceeds to hit 24 of 40 from deep 3 — an impressive 60 percent. The training won’t conclude until later tonight, right before Max’s bedtime, when he’ll retreat to the family garage to practice his ball-handling. He does this routine four days a week, and that’s on top of yoga warm-ups, twice-weekly practices with his club team and tournaments every other weekend. It’s a rigorous schedule, yet a necessary one for the 5-foot, 3-inch, 100-pound Max, who compensates for his lack of size by shooting lights out from 3. No wonder, then, that his favorite player is Steph Curry — the physically unimposing Golden State Warriors point guard who’s overcome his biological limitations by turning himself into the greatest shooter basketball has ever seen. Max and Stuart have made it their mission to fashion Max in Curry’s mold, breaking down the MVP’s shot in meticulous detail and doing their best to replicate Curry’s otherworldly accuracy as a 3-point shooter. They’re closer than they were 11 months ago when they started this training regimen, but there’s still much to be done, such as working on Max’s lack of strength, which is slowing down his release from deep 3. To say Stephen Curry logged the best 3-point shooting season in the history of professional basketball in the 2015–2016 NBA season would be an understatement. Rather, Curry obliterated preconceived notions about what was possible shooting-wise, setting the record for 3-pointers made in a season with 402, shattering the record he set last season — 286 — and leaving the next-best 3-pointer in the league, teammate Klay Thompson, in the dust at 276. Perhaps the greatest indication of Curry’s otherworldly shooting prowess, though, is his unprecedented efficiency. Several players — Jordan, Kobe, Lebron, Iverson — have averaged 30 or more points per game during the 3-point era, but Curry in 2015–2016 was the only player to do so while playing less than 35 minutes a game (beating Michael Jordan’s points-per-minute average in 1987). The accomplishments are all the more impressive considering Curry doesn’t fit the physical mold for premier NBA scorer set by Jordan and followed by Kobe and Lebron — an explosive, physically dominant player who imposed his will on hapless defenders, breaking them down off the dribble and forcing his way to the basket. At 6-foot-3 and just 190 pounds, Curry is small by premier scorer standards, and his playing style is less militant than many of the NBA MVPs who preceded him. One of the knocks on Curry when he entered the league in 2009 was that he was relatively unathletic and would struggle against physical defenders. The naysayers didn’t anticipate Curry’s shooting to be so great that it would more than make up for any perceived physical shortcomings. Whether Jackson’s position — that those darn kids today take too many 3s — is legitimate or the whining of a stodgy old-timer is up for debate. 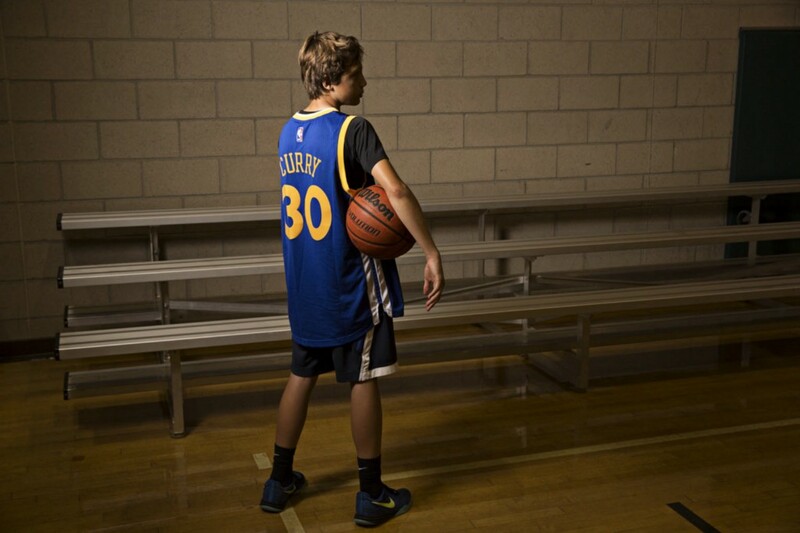 But it lends credence to Curry’s otherworldly shooting prowess and the influence it’s had on youth basketball. 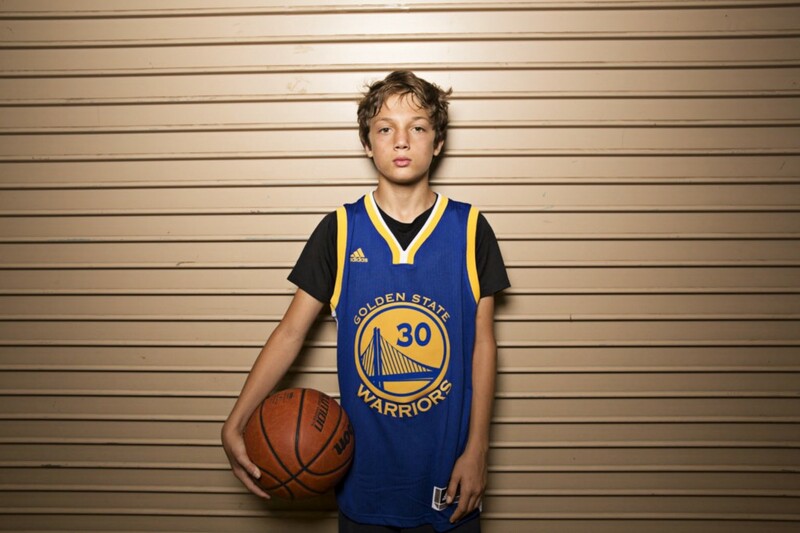 Much like with Michael Jordan and dunking, Curry’s 3-point shooting has been so stellar that kids have emulated his playing style — so much so that 3-point shooting has taken precedence over developing other skills for many young players. The official training session may be over, but the instruction has carried over to the Wolff residence, where Stuart and Max watch Curry dominate in Game 2 of the Western Conference Finals, hoping to glean something from his performance. Stuart marvels at Curry’s shot, pointing out its mechanics to Max — the hips squared at the basket, the tight elbow, the high release, the fingers curled on the follow-through. Curry will end the night with 28 points, leading his Golden State Warriors to a 27-point rout over the visiting Oklahoma City Thunder on 9-for-15 shooting from the field and a ridiculous 5-of-8 from behind the 3-point line. This is the standard to which Max aspires. To be clear, Stuart is not your overbearing sports dad who screams, red-faced, from the stands all game. Stuart has no delusions about his son making the NBA one day. He knows the chances Max even plays college basketball are slim barring a growth spurt and corresponding improvement in skill. Still, Stuart wants to help Max improve before Max enters high school this fall, where he’ll play in the highly competitive greater Los Angeles region, which regularly produces Division-I college and NBA caliber talent. And Max’s only chance to make a meaningful contribution to the team is to be one of the best 3-point shooters on the floor. Earlier, Max entered the data on his shooting practice from that day into a Google Spreadsheet. He’s been keeping track of his 3-point shooting since last July, when he first started the regimen. Now Max hits more than 50 percent of his 3s in most training sessions, according to the line chart of Max’s shooting data, and his accuracy has climbed about 10 percentage points over the past 11 months, settling around 68 percent. On a great day, Max will hit 75 percent of his shots, and he hopes to consistently hit 90 percent by the end of high school. Max says the training has improved his shot selection and confidence in games, resulting in 7-for-10 3-point shooting performance over the course of his last tournament. All 21 of his points came from 3s. “I didn’t score one layup or one free throw,” Max says proudly. Normally, this would make Max seem like a “gunner” — a me-first shooter who takes ill-advised, low-percentage shots that hurt a team’s chances of winning. But for Stuart, a Ph.D. in electrical engineering, it’s the opposite: Concentrating on the 3-point shot makes simple, mathematical sense, both for an individual player and for a team. 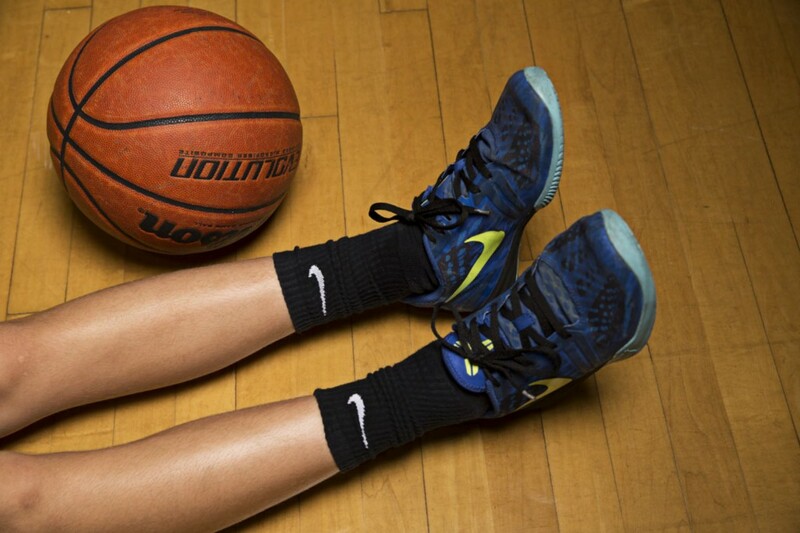 If a 3-pointer is worth 1.5 times the value of a regular 2-point shot, then a player can be 30 percent less accurate from 3 than from 2, but still be a more efficient scorer, Stuart explains. Plus, it extends the defense, creating more high-percentage opportunities near the basket for other players. “What was once considered a bad shot, Curry has made a good shot,” Stuart explains. And right on cue, Curry nails a shot from a several steps behind the arc, eliciting awe from the fans in the stadium and the Wolffs on the couch. “See how he extended the range there?” Stuart asks Max. And Max nods. Judging by Max’s club team game on May 28, Jackson is right about today’s young players being 3-point crazy. Max’s team, the Simi Valley Cagers, is playing in the San Diego Sol Memorial Day Invitational. The tournament is housed in what appears to be a converted airport hangar. There are at least a dozen games being played simultaneously on the structure’s many courts, turning it into a cacophony of air horns, dribbled basketballs and screaming parents. It’s maddening. It might explain Max’s struggles today, as he misses all six of his 3-point attempts in the game. Combined, the two teams take more than 20 3-pointers in the 28-minute game. And yet it’s the 3-point shot that secures a victory for the Cagers. One of Max’s teammates hits a 3 with less than a minute left, putting the team up by 1, the final margin of victory.